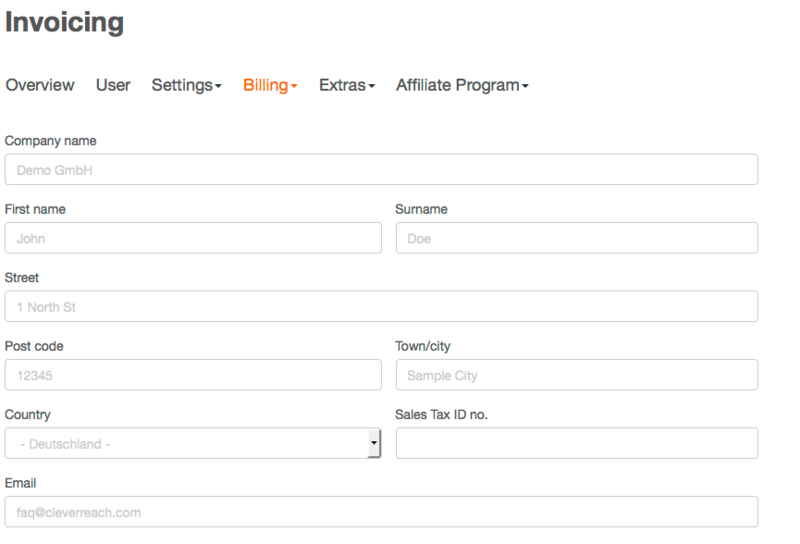 The generated invoices will always be sent to the registration address you selected for your user settings. You will find this information under [My Account] > [Settings] > [Your Details]. If you would like to use an alternative address you can enter this under [My Account] > [Billing] > [Billing address]. The subsequent invoices will then feature this new address. Information marked grey indicates an exact match with the data from your account. If necessary you can enter different information into the respective fields. The invoices will be delivered via email (to the registration email address as well as the newly entered email address). If you are not required to pay VAT please make sure that you mention your country and also provide the VAT-ID. Should you require the invoices to be delivered via mail please contact Support. All clicks and unique clicks / opens – where is the difference?